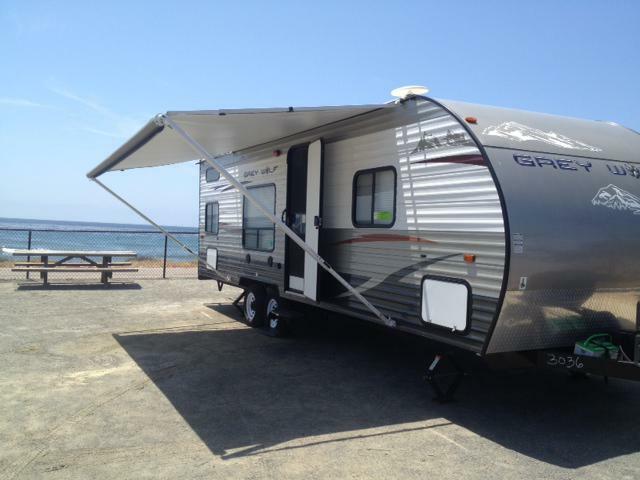 Discount Trailer Rental Rates now available for Campland Campground, call us for more details! RV Motorhome Rentals Delivered and set up and Campland San Diego. If you want to enjoy camping in San Diego you have a few choices, from camping on Mission Bay San Diego and Camping on the beach along hwy 5. First, if you are looking at Mission bay for camping it's a great Choice. You can choose from Campland on the bay San Diego or Mission Bay RV park Resort. Campland RV Resort and Mission Bay RV Resort are both right on the bay. Campland on the bay in San Diego is a private campground park and Mission bay Campground is a city park located near the boat ramps on Deanza Cove. Campland on the bay has a swiming pool, full hook-up sites, Partical Hook up sites, Wifi Internet, RV dumping area, kids play area (Huff and Puff), Campland General Store, Club House area, Boat Ramp and a Beach area. Campland on the bay has a full rental department that offers some boats and bay toys. Most sites at Campland offer full hookups, somesites such as a "Supersite" offer privacy within a fenced area. This site even has a private whirlpool and full size washer and dryer. For the kids Campland has a gameroom which featues many arcade games. You can also rent bikes and ride along the bay. Other activities for kids while camping, include volleyball, scavenger hunts, sand castle building contests, campfire sing‑alongs, ping pong, tie dye and other arts and crafts. Usually, on holidays at the Rv park in San Diego they have themed events all around the park. Campland is the great place for many families. The parents can come enjoy the park while their kids find plenty of things to do in a safe environment. Many campers return on a yearly basis for family vacations in San Diego. Mission Bay RV park is located by De Anza Cove in Mission bay camping area. This park offers full hook-ups and also is right on the bay. The park has security at the main gate and offers full hook-ups. Just along the park you can relax on sort of a private beach area for De Anza cove residents. If you choose Campland on the bay or Mission bay Campground you can enjoy Mission bay, each park offers a park like setting right on the water. Where you can rent boats, wave runners, fish, water-ski, picnic or just relax on the bay. Getting to Campland, Mission Bay RV park or Mission Bay itself is quite easy; all are off highway 5 in San Diego. Here at Albert’s RV Rental we offer free delivery to both Campland on the Bay or Mission Bay RV park. Go Camping at Campland San Diego and enjoy yourself. While you’re at Campland RV Park San Diego or Mission bay park you can enjoy going fishing at Seaforth Boat Rentals, they offer all sorts or boats from jet skis to ski boats. They also have boats that go on ½ day deep sea fishing trips. They offer all full equipment, so all you need to do is just show up. Seaforth is about 10 minutes from Campland on the bay and Mission Bay RV Park. Or you can visit Seaworld or the San Diego Zoo and enjoy a day away from the campground in San Diego. Tripadvisor:Has unbiased reviews from fellow campers. Insider Pages: Reviews from this year from fellow campers. City Search: Current reviews from fellow campers. RV Park Reviews: Has up to date reviews of campgrounds around the United Startes. Campland Trailer Rental discounts see our discount page.